In brief, I am a New York-based professional stage manager and computer geek, and this is my site about both those things, and in particular how technology can be used to assist in stage managing. This is a picture of me eating a leek that was used as a prop, while calling Henry V at the New Victory Theatre in New York. If you want to know more about me personally, I have written a more extensive biography on each of the three main topics the site covers. In the course of my career I've had a lot of opportunities to speak to students and theatre lovers about stage management, stagecraft and the general goings-on onstage and backstage, as a moderator of post-show audience discussions on Broadway and on national tour, and in master classes on stage management with students from elementary school to college. I'm always excited to participate in these kind of events. If you're looking for someone to talk to your class or other group, feel free to contact me (see below). I have a Stage Management FAQ which is a collection of frequent questions and my answers, gathered from interviews, reader emails and master classes. In my spare time, I am also an amateur graphic designer. I was once paid in Starbucks cards for my work. Does that make me a professional? This site began as a blog called The Go Button - where theatre and technology converge. The blog began in 2007 and all posts are available on this site. The transition from blog to full website came about in May of 2009, when I had two weeks between jobs, and determined to learn to hand code websites. I created the site using Espresso, and today use Coda, both one-window website editors for the Mac. I began writing the blog The Go Button mostly because I wanted to find something to blog about. I didn't want it to be a random blog about what I had for breakfast, it had to be something that people would actually want to read. So I searched my mind for something that I liked to write about, that I knew something about, and that wasn't adequately covered by larger and better blogs out there. I have a great love for theatre, and also a great love for technology, and while they are often separate and contradictory interests (I have $120 -- do I see a Broadway show or upgrade the power supply on my gaming rig? 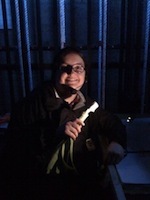 ), the opportunities I find to combine the two have made me a more successful stage manager. My blog became a place for me to share my practices and discoveries about theatre and technology as separate topics, and in combination. My hope for my readers is that it will allow other geeky or non-geeky theatre people (or anyone, really) to get ideas about new things they can do themselves. I also have had a lot of opportunities in my career to work with, train and teach new stage managers and stage management students. I enjoy being able to provide guidance and tips for people who come after me, because I received the same kind of help when I was starting out, and also have had to figure out a lot of things for myself over the years and it might have been easier if someone had just told me! And I'm still learning new things all the time, and enjoy passing them on. I'm pleased that the material on the site has been suggested by some theatre teachers to educate their future stage managers, and because of that I created the education tag on the blog to narrow down to the posts that seem most useful for someone wanting to know what it's like to be a stage manager.